21st January 2010. IN STOCK NOW - the highly anticipated 5" Hema Navigator. 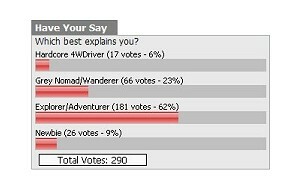 Polls - which best explains you?, New map atlas, Email ExplorOz pages, and a New Trek - Northern Yilgarn Conservation Reserves. IN STOCK NOW - the highly anticipated 5" Hema Navigator. In addition to all the onboard features of this great unit, the Hema Navigator is also compatible with all ExplorOz mapping, from Treks to Driving Directions, which are available as free downloads to all members and if you’re not already a member, purchase the Navigator and you’ll receive an annual ExplorOzmembership free. Also, don’t forget that all current member’s receive $49.95 back in Member Money and FREE Shipping when purchasing this item. We strive to remain competitive in our special offers, so if you find a better deal on this product, please let us know. 15% off all paper maps - for a limited time only. If you’re unsure of what you need don’t forget you can do a geographic search in the shop, simply select the area you’re travelling on the map from theShop homepage. 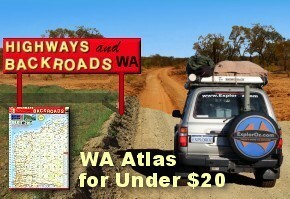 The brand new road atlas "Highways and Backroads of Western Australia" has finally arrived in stock, and best of all it’s a great buy at only $19.95. This atlas contains up-to-date 2010 mapping, and provides clearly marked locations of many different types of landmarks, local attractions, and accommodation. 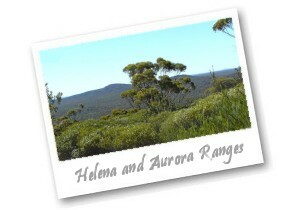 The Northern Yilgarn is a collection of existing and proposed conservation reserves in WA’s goldfields region and our trek writer has compiled a wonderful 3 day trek taking in the highlights including Helena and Aurora Range, Mt Manning Range, Jaurdi, Mt Elvire and Die Hardy/Jackson/Windarling Ranges. This isn't a difficult trek with much of it on formed unsealed roads but parts lie in remote and lonely lands with track conditions to match. Sounds like something you'd like to explore? It's all here in ExplorOz Trek Notes - Northern Yilgarn Conservation Reserves. Here's a nifty new feature. 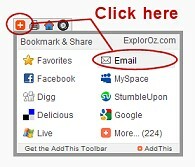 On ExplorOz, you can now "email" your favourite ExplorOz pages to your family and friends. To use this facility, simply use the grey toolbar at the top of the site (just beneath the Contact Menu), clicking on the orange icon with the white cross will open the Bookmark & Share menu and amongst other options, you'll find the new "Email" option. All you do next is type in the recipients email address in the ‘To’ field; add you own email address in the ‘From’ field; insert a short message to let them know what it's about, and click Send. Too easy! Discover Oz Productions creates promotional DVD’s or Internet web casting tailored to your business needs. RV Asia Pacific Agency have been importing and distributing Adria products throughout Australia since 2006. Nomads Notes Comprehensive Travel Diary Software features: trip diary, photo album, fuel usage, and more. Drysdale River Station - Enjoy riverside camping or camping with powered sites at the Homestead Campground. Cairns Offroad Training & Tours - Get an insight into the conditions you may experience in the Cape York area.